A piece of the industrial district served by the Water District is coming back to life after a couple of years of inactivity. These manufacturing facilities supporting offshore energy development will generate new employment opportunities for the region. EMAS AMC, Inc. is in the process of reactivating the 120-acre base used to assemble and spool continuous lengths of pipe for subsea placement. 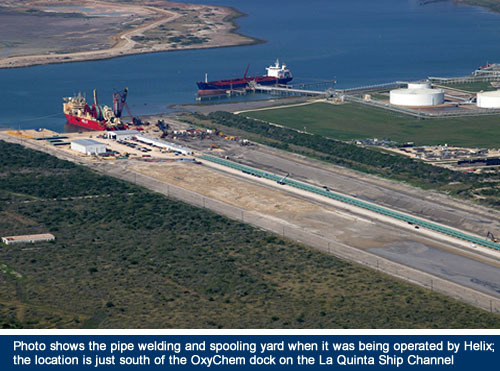 The Ingleside facility located on the La Quinta Ship Channel was purchases from the previous operator, Helix Energy Solutions, which exited that business in 2012. Project manager Paul Byington, who previously worked for Helix, said that EMAS could be in full operation later this year. Miles of pipe can be assembled at the plant. The pipe is welded in a shop building and fed out onto a holding rack in mile-long lengths. A spooling ship reels one of these lengths of pipe onboard, another length is welded on and the string continues to be spooled on the vessel. Offshore the pipe goes on the sea floor and is connected to manifolds and subsea production devices. EMAS is a contractor for the offshore energy industry with dozens of vessels working worldwide. Byington said the company plans to increase the level of work at the facility and will be bringing in larger vessels than those used by Helix. EMAS is planning to enlarge the site’s ship mooring basin and turning area beside the ship channel. The company needs to make room so that it can have two pipe spooling vessels at the dock at the same time. HDR Engineering is assisting with permitting. In a presentation to commissioners of the Port of Corpus Christi Authority, Byington reported that Parker Subsea is moving forward with development of a fabrication yard on the EMAS property at the opposite end from the dock area. He expects Parker to begin construction in late 2014. The company makes control umbilicals and manifolds for the offshore energy industry. These facilities will have minimal water supply requirements. They are located inside the City of Ingleside and are served by an existing city water main.